Made from high quality 600D Nylon. Designed with adjustable shoulder strap and close. Good gear for airsoft games, paintball, shooting, wargame. Special pouches for flashlight,knife,shotgun,and small articles. Inner side,made by Cellular ventilation network,and adjust by automatic button. Wear it like a holster across your body and concealed under your coat, great for keeping your hands and pockets free. If for any reasons you are not satisfied,please give us an opportunity to improve your experience by contacting us through " Your Orders" tab in your Amazon account. We will try our best to help you. Made of 600D Nylon fabric. High quality and well design shoulder holster with loaded features,reinforced thread stitching and double-edge stitched at pressure points for extra durability. With breathable mesh lining,it's circulates air to keep you cool and offers comfortable fit. Equipped compression buckle,comfortable close fitting and automatic adjusting holster button,it all offer unobstructed quick-draw and re-holster of pistol, modular design allows for both left and right handed use,has straps to secure to tactical utility belt. 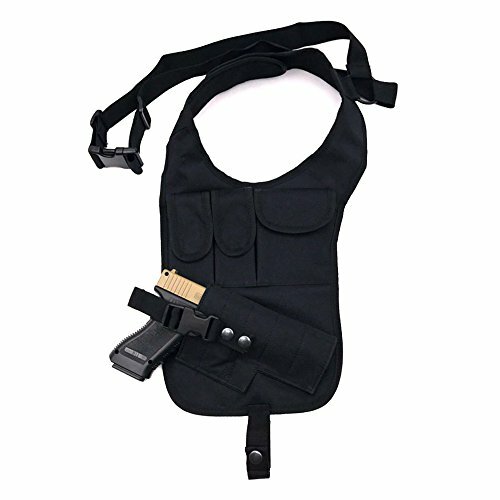 With adjustable shoulder strap to securely hold holster in position & two flashlight pouches and one magazine holster,which you can put flashlight and other small things or accessories you need in added pouch. Universal design to fit most medium to large auto pistol and revolvers,such as Gun Glock, Ruger LCP, M&P, Sig Sauer, Ruger etc. The end of the holster also opens to allow an extra long barrel revolver, convenient to use. Ambidextrous shoulder strap, well-padded shoulder harness for maximum comfort, perfect for hunting, trekking, outdoor sports and more outdoor activities, can be adjusted from Medium to Large. Adjustable size range: the shorter size of the case 30 inches, the longest size of the case 50 inches. If you have any questions about this product by TEKCAM, contact us by completing and submitting the form below. If you are looking for a specif part number, please include it with your message.